Most men keep their accessories to a minimum, so the ones they wear stand out. The Tag Heuer Grand Date Formula 1 Men’s Chronograph WAU1113.BA0858 makes for a fine fashion statement while providing a lot of useful functions for the man who takes the time to learn how to use them. The watch is rugged, and generally dependable, with a few small caveats. Let’s start with the looks. This watch has them, providing a look of cool precision that’s supported by all the instrumentation this model has to offer. The band and bezel are stainless steel, and the watch face is white with luminous markers that are easy to read in dim light. The scratch-resistant sapphire bezel is coated to reduce glare, and the subdial has a nice spiral pattern which sets it apart and makes the date display even easier to read. The brand logo gives a nice little shot of red that looks good against all that white. This is a handsome watch. Watch enthusiasts say that Tag Heuer has generally good movements, and the quartz movement inside of this one should provide accurate readings. The battery should be good for at least two years, so you shouldn’t have to worry about that for a while. Although most men are very happy they purchased a Tag Heuer watch–gushing about their “Tags”—a few have mentioned that their winding stem and chronometer buttons have fallen off. This can be fixed, and the problem seems to occur infrequently, but it’s something to keep in mind. Save your warranty, and make sure to shop around, because different retailers offer different warranties. If you love the watch, but want something with a little more presence, you might want to try it in black. 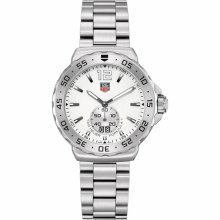 Tag Heuer offers the model WAU1112.BA0858, which is the exact same thing with a black dial. I think it’s a little bit sharper that way, but you might want a watch that’s a little less showy. 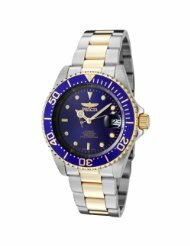 If you like the idea of a dive watch but need a tasteful dose of color, you might be happier with the Invicta Pro Diver Automatic Men’s Watch 89280B which retails for $285. The regal blue and gold is surrounded by a touch of silver, and the Invicta has a great sense of style without being overly gaudy. The Tag Heuer Grand Date Formula 1 Men’s Chronograph WAU1113.BA0858 is a great choice for a guy who wants a watch that goes with everything. The white and silver combo is attractive but not flashy, and there are a lot of fun measurement tools you can play with once you learn how to use them all. The buttons may fall off, but you can reattach them, and as there were only a few complaints, I think these are isolated incidents. This a fun watch which adds a bit of luxury to your fun lifestyle, and one which you’ll be wearing for years to come. 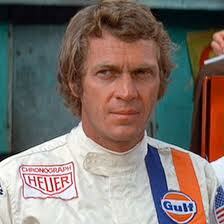 Steve McQueen was a noted fan of Tag Heuer watches.